CONCORD -- Preston Norris is off to quite the start this cross country season. 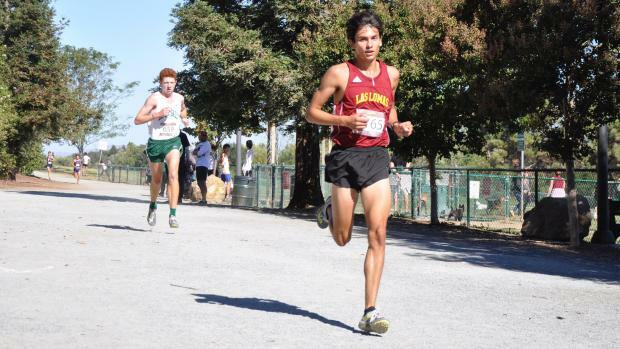 The Las Lomas High School senior won his third invitational race on September 15, outkicking De La Salle's Connor Livingston to win the boys varsity race at the De La Salle Invitational at Newhall Park in Concord, Calif. Norris added the title to his wins at the Lowell Invitational and the Monte Vista Invitational. All within 12 days. "Three invitational wins at the beginning of the year is awesome and I haven't necessarily been putting in a ton of work yet," Norris said. "And I'm looking at my program right now and it's just getting harder. So I'm pretty confident." Norris finished in 15 minutes, 18.2 seconds at the De La Salle Invitational. That was 0.8 in front of Livingston. Norris broke away at about the halfway point in the three-mile course. "Everybody was cheering for me and so that helped a lot," Norris said. "I kind of surged through here. I got a couple of yards on him and just kept it." It was a little earlier than Norris planned on going - he was thinking last mile or maybe three-quarters. But he was feeling good and his instinct kicked in. Norris was born in Texas but grew up in Walnut Creek. He played multiple sports as a kid, especially soccer, where he played on the right side on defense. He first realized he was a pretty good runner in fifth grade, when he ran a mile in about 5:36. In the summer before he entered high school, he competed in the Junior Olympics and decided it was time to switch. "I do a little bit but I wasn't the best player," he said. "I'm a better runner." Norris had a tough junior year, coming down with bronchitis late in the season and also suffering from minor knee injuries. "It messed me up pretty bad at NCS and state," Norris said. "I couldn't basically run at all the last three weeks. "That was a bummer but I'm just going to wash my hands a lot this season and not get sick." Norris won one of nine races on a slightly windy Saturday morning. 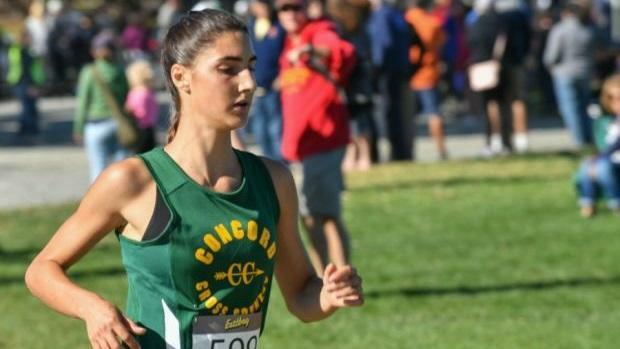 Concord's Rayna Stanziano (pictured) was dominant in the girls varsity race, winning in 18:07.3. That was more than 14 seconds ahead of the second place finisher, Hope Bergmark of Pleasanton Amador Valley. Bergmark's performance helped the Dons win the team title with 90 points -- 10 in front of East Bay Athletic League rival Danville San Ramon Valley. Amador Valley also won the varsity boys race with 83 points, easily outdistancing Carmichael Jesiut (111). Jack Gray and Aidan Boyle finished 3-4 to pace the Dons. Jesuit's Todd Russell won the junior varsity boys race in 11:06.9 on the two-mile course, leading a 1-2-5 finish by the Marauders. However, Jesuit tied with San Ramon Dougherty Valley with 33 points and the tie was broken by the finish of the sixth runner for each team. The Marauders Eric Huitt took 27th with the Wildcats Justin Luurtsema in 31st giving Jesuit the team title. Doughtery Valley's Eesha Chakraborty and Aesha Valia took the first two spots in the junior varsity girls race, finishing together at 14:03.3. Chakraborty just edged her teammate. The Wildcats easily won the team title with 37 points -- 60 in front of second place Amador Valley. Livermore Granada's Parker Moore won the boys frosh-soph race in 11:15.5. The Matadors took the team championship as well with 83 points, edging Jesuit (89). Helena Janku, a freshman from Larkspur Redwood, won the girls frosh-soph race in 13:01.2. Granada won the team competition with 34 points.